Every once in a while, you trip over a win-win idea so simple, intuitive and novel, it just demands a second look – maybe even some evangelical sharing. I experienced just such an idea earlier this year while watching TV at a friend’s house. He’s the earliest high-tech adopter I know, so it’s always interesting to see what he’s experimenting with when I visit. On this particular occasion, I was marvelling at how good his big-screen HDTV looked – almost angelic, like it was surrounded by a halo of soft, warm light … and that’s when it hit me [insert record scratch sound effect here]. His big-screen TV did actually have a halo of soft, warm light surrounding it, emanating from somewhere behind the TV. Wow, what a subtle, pleasant visual effect. And as I was soon to discover, also a great way to help reduce eye strain. 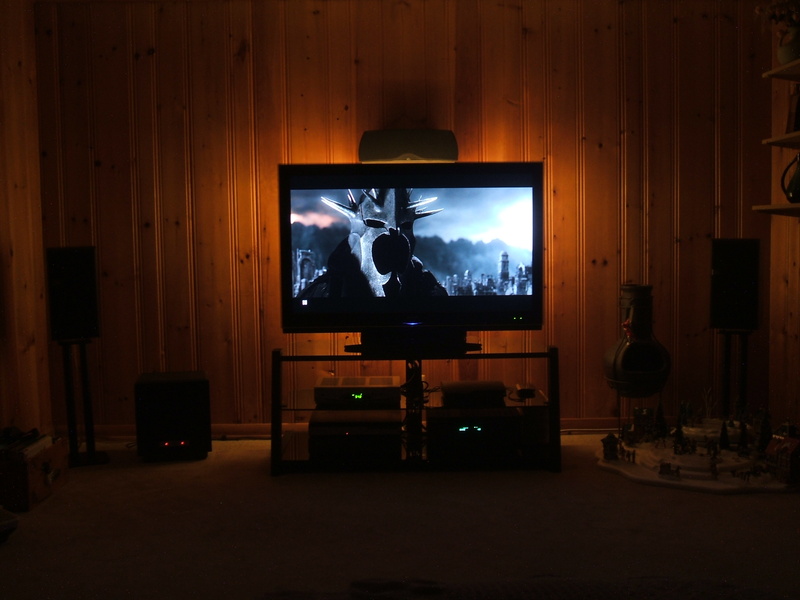 Here’s the approach I used to add the same great indirect lighting behind my 52″ LCD TV. You can decide for yourself whether this win-win idea is worth a second look for your own home theatre system. For esthetics alone, this idea was well worth the price of admission for me. I’ve always been a big fan of soft, warm incandescent (wire-filament generated) lighting. I find compact fluorescent lights and LED lights cold and harsh by comparison and tougher on the eyes. The same goes for indirect lighting: I prefer softer indirect light sources that eliminate all light glare to help reduce eye irritation. Accordingly, for my TV, I placed 3, 12-foot sections of incandescent Rope Light behind the TV to create a soft, warm indirect light source. 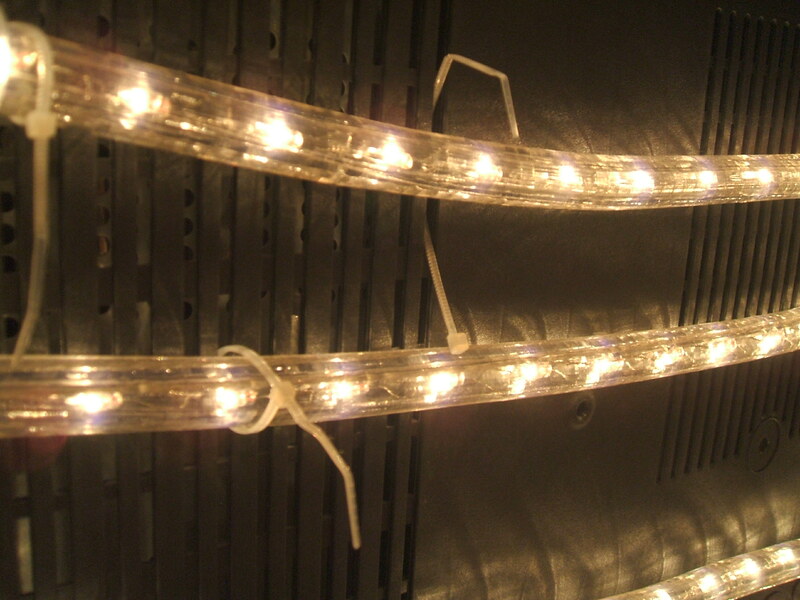 You can find this kind of Rope Light at most big-box retailers and garden-supply stores. I bought the Noma clear indoor-outdoor Rope Light from Canadian Tire, which is available in 12 and 30-foot lengths, can be easily connected together and is semi-flexible (ie., bends easily but not 90 degrees). 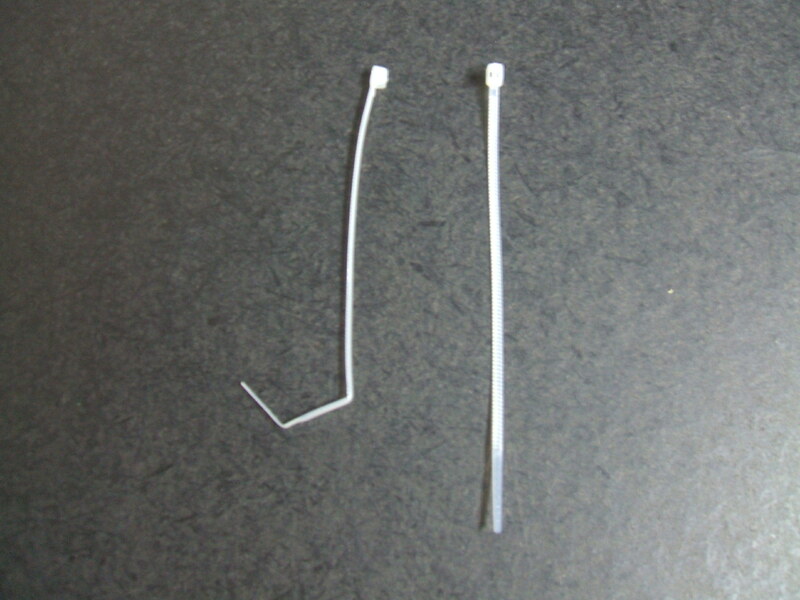 These lights also come with plastic pull-ties, which makes it easy to attach the Rope Lights to the back of your TV: just bend the tip of the pull-tie twice to create a fish-hooked shape, then slip it through the ventilation slots in the back of your TV and pull tight around the Rope Light. 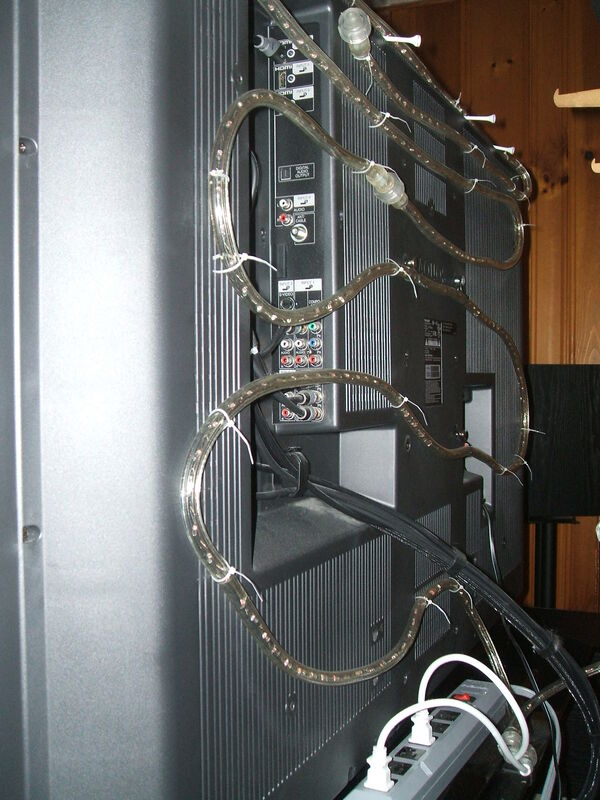 The number of Rope Light sections you choose to attach will depend on the amount of ambient light you want to create and the amount/position of the ventilation slots on the back of your TV. 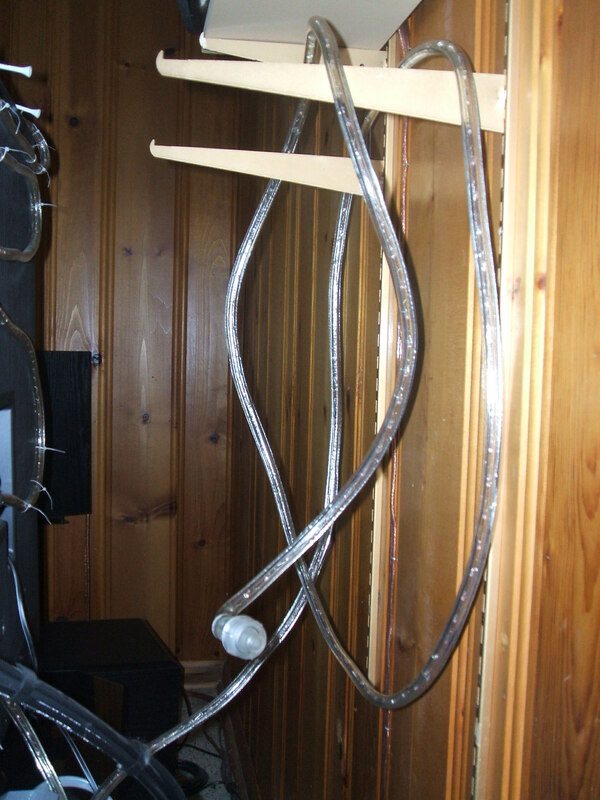 In my case, I could only easily attach 2, 12-foot sections of Rope Light to the back of my TV, so I added a 3rd, 12-foot section by hanging it over 2 shelf brackets I attached to the wall behind my TV (much the way you’d hang a garden hose in your garage). Just make sure you put all the lights in positions where you can’t see them directly from any TV viewing location, in order to eliminate light glare and minimize eye strain. One easy way to help reduce eye strain when watching TV or playing video games is to try to find a comfortable, pleasant contrast between the brightness of your big-screen TV in the foreground and the brightness of the general room lighting in the background. Too much contrast (eg., a bright TV screen in a dark room) will irritate your eyes, as the glare of the bright TV screen makes it hard to focus comfortably for long periods of time. On the other hand, too little contrast (eg., a bright TV screen in an even brighter room or a dark TV screen against a dark background) can also be hard on your eyes, as they strain to find what they’re looking for. Try to aim for a darker room background than your TV foreground – maybe half as bright as the TV screen. Then experiment from there by adding or subtracting lights until you find a contrast level that suits your own personal tastes. 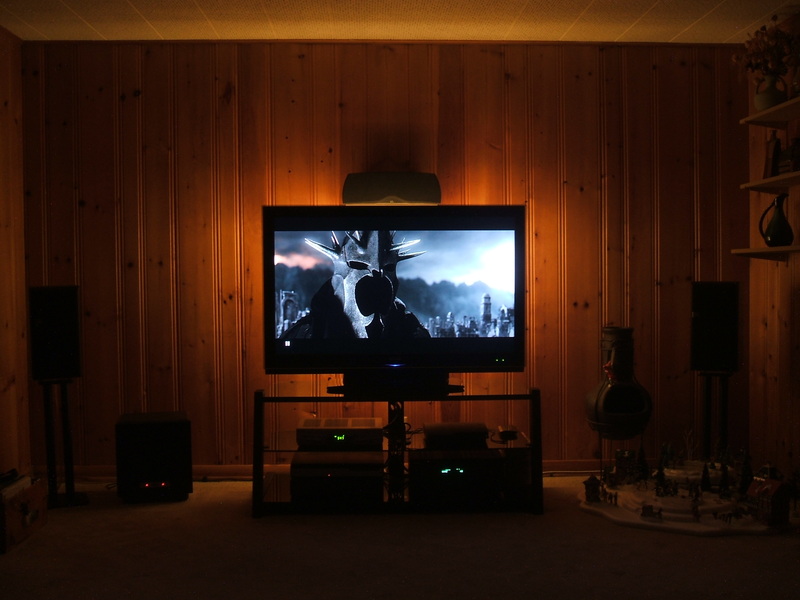 Experimenting with the addition of indirect lighting behind your HDTV can help ease eye strain and bring a little more theater to your home theater. Now that’s what I call a win-win idea. This entry was posted in House, House & Garden, Uncategorized and tagged Big Screen TV, contrast, entertainment, eye strain, HDTV, Home Theater, Home Theatre, indirect lighting, LCD TV, movies by greg kavander. Bookmark the permalink. May try it here, GK. 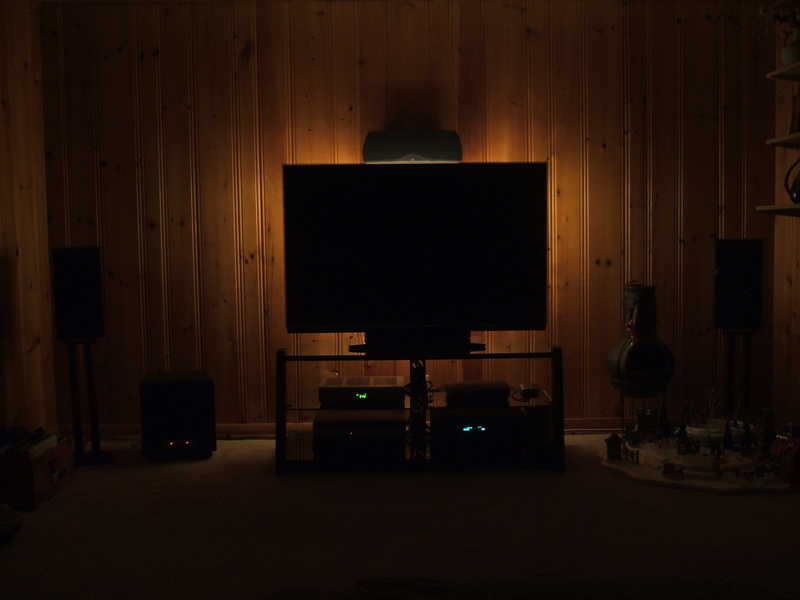 I like the look – I hate too much light when watching a movie – but this looks just about right. I also have dark walls like you do, so it may be worth a shot. Always nice to have different lighting options available. 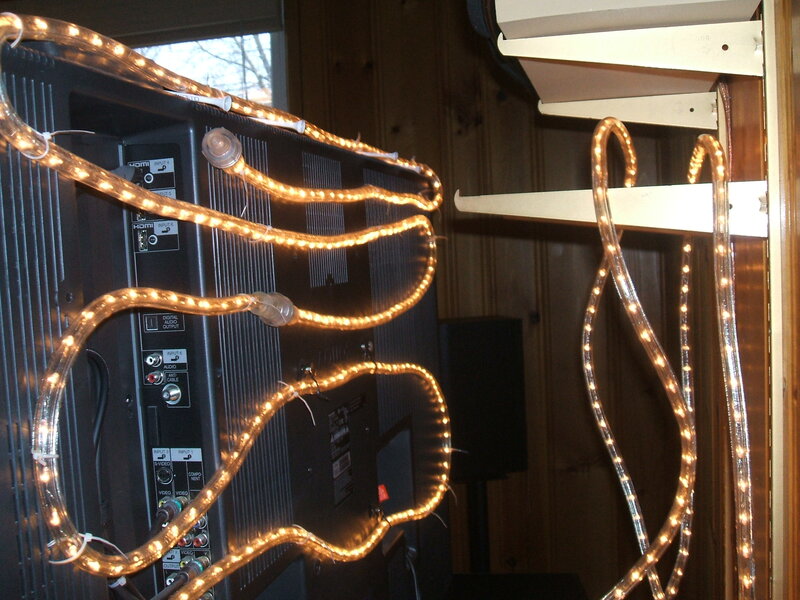 As you can see in some of the photos, I put the Rope Lights in a power bar, so I can turn them on whenever I want. Generally, I use them all the time for video games and once in a while for movies, depending on how I feel and what I’m watching. Greg Kavander shares his knowledge and experience for those who would like to add ambient, indirect lighting behind their HDTV. Lucky for me, I found this article at the perfect time as my family is in the process of updating our home theater setup. 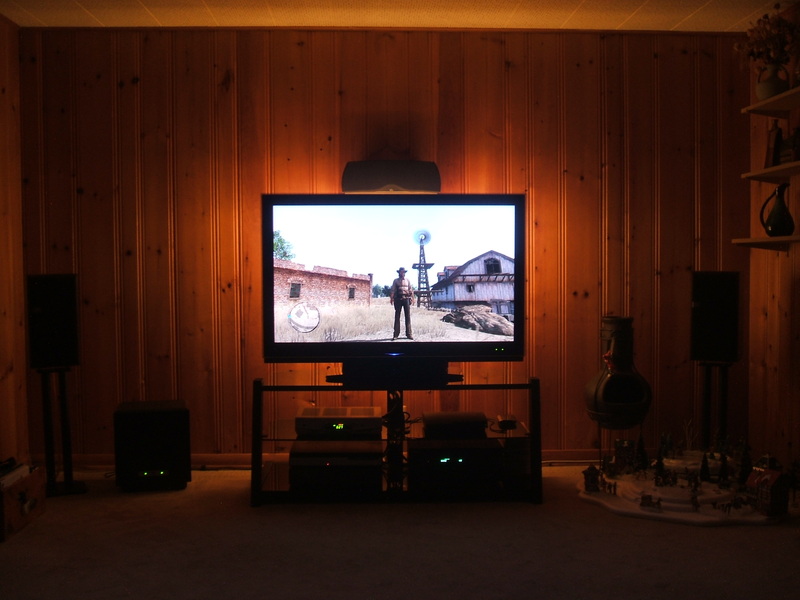 The warm rope lighting is sure to add a nice touch to our game and movie experience. Not only is it a ‘neat’ or ‘wow’ factor, but it’s good for your eyes as well. An affordable and simple solution, that I imagine, a number of home theaters will be implementing this year. Excellent article, Greg. thanks. And I couldn’t agree more with the preference of soft indirect lighting for this purpose over the compact fluorescent or LED option. Glad you liked the post. Hope you get as much satisfaction as I got from adding the lights. Perfectly complimentary to Skyrim, if you’re a fan. Cheers.